After 1692, the production of tin halfpennies and farthings stopped, apparently because of public resentment. 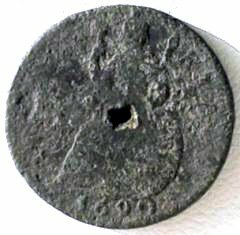 Tin coins easily corroded, probably because of impurities, and their low intrinsic value meant that they could be easily counterfeited, and in 1694, copper farthings and halfpennies were once again produced. With the resumption of copper and the cessation of tin coinage, the edges reverted to plain instead of inscribed, because the probability of forgery was now decreased. As we have stated above, the tin and copper coins now had their portraits facing to the right, the same way as all the precious metal coins for the same monarchs. This arrangement has since continued. The farthings and halfpennies of William III, after the death of Mary, continued where those of the joint reign had left off, except that the production quality of many of the coins declined considerably. Although the blanks were supposed to be made from rolled and milled strip, they were often cast because it was cheaper. The lower quality was probably due to a combination of factors rather than purely the use of cast blanks. In 1699, a new engraving of Britannia was introduced on the halfpennies. Her right arm is lower and appears to be almost resting on her knee rather than being held at head height. It is not known who engraved the new design, but it is generally considered to be inferior to previous designs. Around this time, there were frequent spelling errors in the inscriptions, and other evidence of poor workmanship, so that the copper coins of William III are probably the lowest quality of all British coins. It can be difficult to be certain which are forgeries. As you can tell by the lack of a photograph, we are looking to buy choice specimens of Britannia coins in copper of either William & Mary or William III, mainly so we can photograph them to help complete this page.